We would have seen news articles about public throwing ink on politicians's faces. Arvind Kejriwal has been the target of ink attacks on more than one occasion. This tradition started in my childhood in my school. We had this unholy tradition of throwing ink on white uniform shirts on the last day of every academic year. In school, I had a friend named Ershad. He studied with me from class 6 to class 10. On the last day of my class 6 exams, I sprayed blue bril ink on Ershad's shirt and ran away. After two months of summer holidays, I entered school on June 2, 1993 with my new set of uniforms. 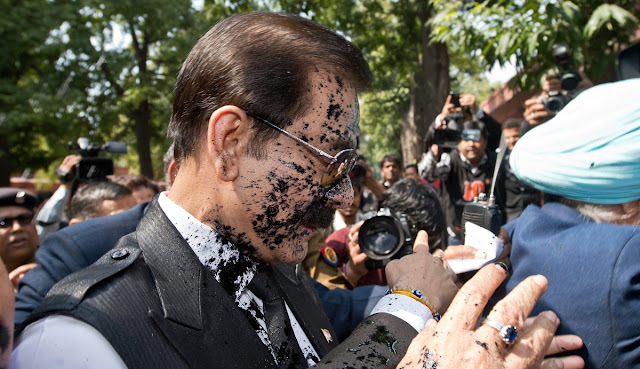 I did not know that Ershad was waiting to take revenge with a full bottle of bril ink. As soon as I entered class, he poured the whole bottle on my shirt and started grinning. It was a wednesday. I hated Wednesdays after that. Today is June 2 too. And it has been 23 years since that incident took place. I am recording it in my blog because I know that varalaaru is romba mukkiyam. Have you been inked during your school days?